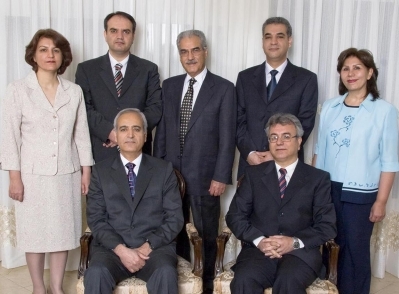 The seven Baha’i leaders who have been in Evin Prison for more than two years were sentenced this weekend to 20 years in jail for a series of false charges based on their religious affiliation. The two women and five men have been in Evin prison since 2008 with sparse court appearances and continued and rejections to see their attorneys. “If this news proves to be accurate, it represents a deeply shocking outcome to the case of these innocent and harmless people,” said Bani Dugal, the principal representative of the Baha’i International Community to the United Nations. “We understand that they have been informed of this sentence and that their lawyers are in the process of launching an appeal,” said Ms. Dugal. There are over 300,000 practicing Baha’is living in Iran, who have faced jail time, the desecration of cemeteries and the destruction of entire villages in recent years. The defendants were accused of espionage, spies for Israel, conspiracy against the Islamic Republic of Iran and the establishment of an illegal administration. The Woodrow Wilson International Center for Scholars will hold a talk on US-China relations from 1:45-5:30 PM with a number of speakers from Harvard focusing on economic challenges. The Congressional Executive Commission on China will hold a hearing on “Political Prisoners in China: Trends and Implications of US Policy” with representatives from Human Rights Watch, the Dui Hua Foundation and the Council on Foreign Relations. It will take place in room 628 in Dirksen. The Senate Judiciary Committee will hold a hearing on “Government Preparedness and Response to a Terrorist Attack Using Weapons of Mass Destruction.” At 10 AM in 226 Dirksen. CSIS is holding the 2010 International AIDS Conference at 9:30 AM in Vienna with speaker Jeff Crowley, the Director of the US Office of National AIDS Policy for the White House. Also, CSIS will hold a forum to discuss Mexico’s oil production in the wake of the Gulf Oil Spill with Juan Carlos Zepeda Molina, director general of the National Hydrocarbon Commission of Mexico. CSIS will also hold a press conference from 10:30 AM-12 PM with Deputy Secretaries of State James Steinberg and Jacob Lew on the next phase in America’s relationship with Iraq. Location: St. Regis Hotel, 16th and K Sts. NW. At 12 PM, the Spy Museum will hold a book discussion and signing on “The Secret Sentry: The Untold History of the National Security Agency” at the International Spy Museum on F st.
Washington, D.C. is among the many cities scheduled to hold protests against the execution of Sakineh Mohammedie Ashtiani this afternoon. I found out on Twitter that the protests are set for 30 cities including New York, London, Paris, Berlin, Washington, D.C. and Ottawa. While executions happen quite often in Iran, these protests are meant to remind people that the fight for her life isn’t over. Although government officials said they will not stone her, she will still likely be executed–probably by hanging. On July 2, groups held protests against her stoning outside of the Pakistan Embassy (where the Iranian interests section is located. They don’t have their own embassy because the U.S. and Iran don’t have diplomatic relations). Today, protests will take place between 12-3 (yes…in the heat) at the Pakistan Embassy. I would have gone to check it out if I wasn’t at home in Indiana visiting family. But if anyone is there…send along pictures! For more info, visit the International Committee Against Stoning. While many murders do happen from cheating husbands and wives, that doesn’t forgive the execution of people as a law for adultery. Another commenter wrote that the international community should stay out of this because she is being executed for the “murder of her husband” rather than adultery. As I noted in a previous post that she was accused of being an accomplice in her husband’s murder, and in the U.S., a person can be sentenced by being associated with the murder of someone. However, in her case, she was also additionally punished for the adultery and received almost 100 lashes in front of her son. While I agree–countries cannot force laws upon others–I do think there are certain universal, basic, fundamental human rights that cross borders. And those who subscribe to those rights (rights to safety, equality, expression, belief, etc) should hold others less fortunate accountable. That’s where the international community can apply pressure to stand up for the voiceless. Did I forget something? Email me at ladansusan@gmail.com to list a foreign policy event. (Latest from the AP) Netanyahu is in Washington–Jewish groups pressuring Israeli Prime Minister Benjamin Netanyahu to stop archaeological digs and construction that’s said to be desecrating ancient Jewish cemeteries in the Holy Land will gather in front of the Israeli embassy, rally in front of the White House, and march to the State Department. At 2:15, Netanyahu will be at the Pentagon with Sec. Gates for an honor cordon. UPDATE: In the afternoon, Secretary Geithner will meet with Heng Swee Keat, the Managing Director of Singapore’s Monetary Authority, and Chan Heng Chee, Singapore’s Ambassador to the United States, at Treasury. Closed press. Counternarcotics policy should be refocused to discriminate against illegal armed groups and corrupt officials in enforcement. CSIS will hold a talk on the need for an OSCE head of state summit in light of recent events in Kyrgyzstan. At the Ministerial Meeting in Athens in December 2009, Foreign Minister Kanat Saudabayev of Kazakhstanreiterated the proposal of President Nursultan Nazarbayev that the OSCE hold a summit of heads of state and government during 2010. The event will take place between 12:15 and 1:45 at CSIS. I will be at the 2010 Campus Progress conference hearing an inspiring panel of young leaders who were hand selected from hundreds of applicants. They’ll talk about important issues like immigration, climate change, LGBT issues, foreign policy and the war in Afghanistan. I’ll be live blogging from here, of course. More details on the event here. New: At 10:00 am, there will be a briefing on Afghanistan with Lt. Gen. David M. Rodriguez, commander, International Security Assistance Force Joint Command and deputy commander, U.S. Forces at the Pentagon. Also interesting: The Voice of America, at its huge, nice headquarters, will have a press conference on AIDS in preparation for the international AIDS conference. The speaker will be Anthony Fauci, Director of the National Institute of Allergy and Infectious Diseases (NIAID) at the National Institutes of Health and one of the key advisors to the White House and Department of Health and Human Services on global AIDS issues. Carnegie is hosting a talk on Cross-Strait relations between China and Taiwan. It is an all day panel with lunch included from 10-5:00 at Carnegie. More info here. Brookings is holding an event on the African economy from 2-4. Find more info here. CSIS will be holding a talk on the recent elections in Mexico from 3:00-4:30. For some news on the elections, I recommend following Jeff Antebi on Twitter. Very interesting person to follow! At night, Young Professionals in Foreign Policy will hold a talk on the convergence of foreign policy and economic policy from 7-8:30. I’m really excited about USIP’s Thursday event on bloggers in war zones called “Blogs and Bullets.” I hope to attend and hear many bloggers from the Middle East share their stories and possibly write a post on it for RFE. The event will be webcasted and if I can, I will surely live Tweet it. More info here. Also on Thursday, a talk on the U.S.’s partnership with Hungary at the Potomac Institute with the Ambassador to Hungary. The Berkeley Center will hold a talk on women’s roles in religion and peace building, Brookings will hold an event on Japan, The Stimson Center will hold a talk on Pakistan and Busboys and Poets will feature a documentary on children in Gaza. From July 8-9, the Greek Deputy Foreign Minister will be in town, meeting with the Assistant Secretary for Trade Promotion and Director General of the US & Foreign Commercial Service, Suresh Kumar, at the Department of Commerce. USIP will hold two events tomorrow–one on Southern Sudan and building an education system in conflict at 10:00 and another on war torn societies at 1:00 featuring the release of a framework for Measuring Progress in Conflict Environments (MPICE) developed by the United States Institute of Peace in collaboration with the Department of State, Office of the Secretary of Defense, U.S. Agency for International Development, U.S. Army Corps of Engineers, and the U.S. Army Peacekeeping and Stability Operations Institute.